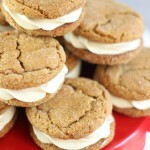 Soft and chewy molasses ginger cookies are sandwiched together with caramel buttercream frosting! 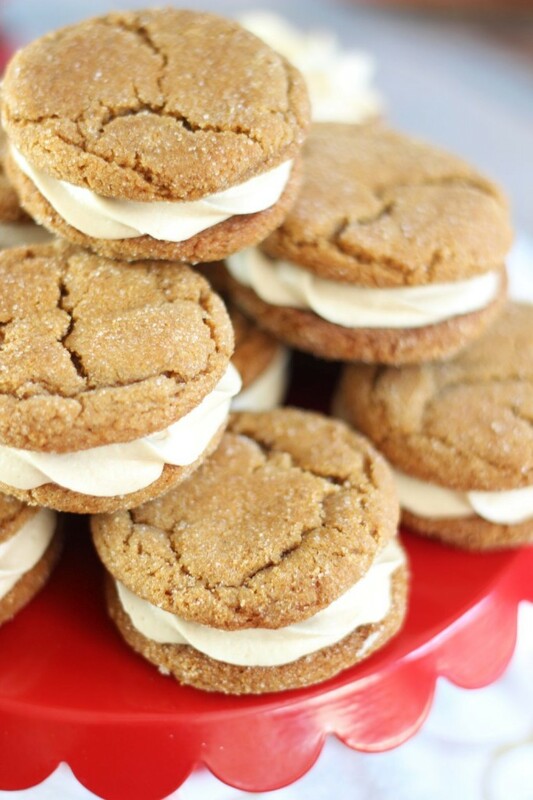 I used my family’s favorite Cracked Top Ginger Cookies to make these delectable cookie sandwiches! Groooooan… it’s Monday already? How did we get here so fast? It was the shortest long-weekend ever. I can honestly say it’s rarely been harder to go back to work then it is today. I spent all of last week making Christmas recipes and getting out all my Christmas decorations. I worked on a lot of blogging tasks for all of you, my fine friends. I also reorganized my closet, my pantry, and re-dyed my hair pink. I don’t know… why not? Life is short, I say. I relaxed. A LOT. But I also managed to get stuff done too, which was nice. Now it all must end since Monday is already here. Meanwhile, even though Black Friday sales were a big disappointment (or is it just me? ), I still want to lay around in pjs and scour the internet for Cyber Monday deals. Anything but go to work, basically. Did you ransack any stores on Black Friday? What’s on your online shopping agenda for today?? Maybe the really good sales are flying under the radar for me, so make sure to fill me in! 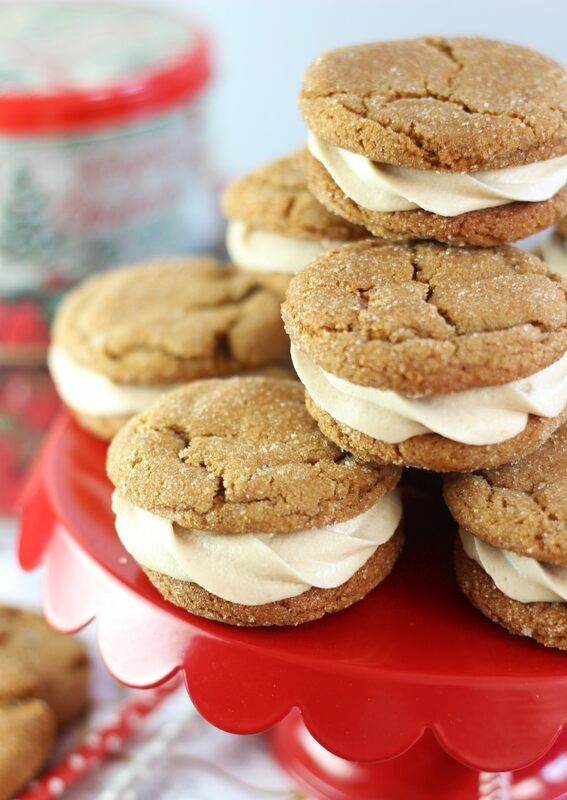 I got the idea in my head that I wanted to make ginger cookie sandwiches using my family’s favorite Cracked Top Ginger Cookies. Collectively, this is probably the most-loved cookie of my family. It’s not my top favorite personally, but it ranks quite high. For everyone else, this is #1. 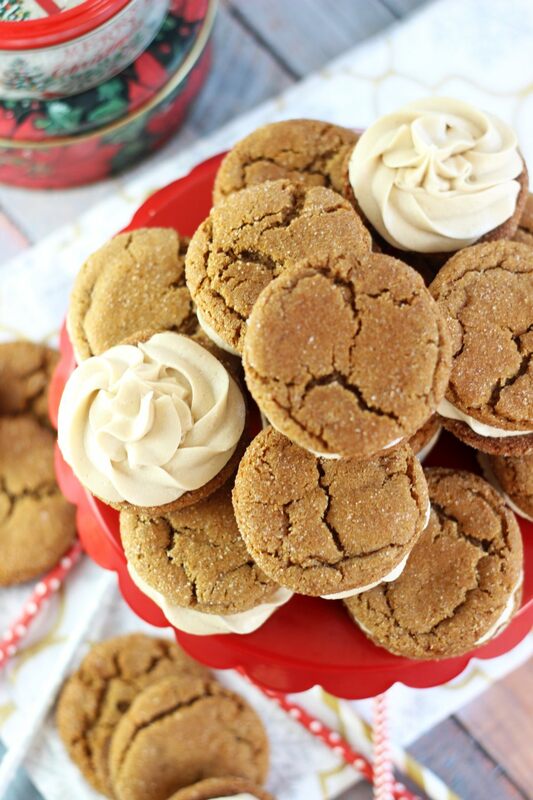 If you like ginger and molasses, these are the best there is. 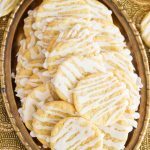 They are a little crispy on the edges, but soft and chewy in the center, and they are full of spice and flavor. The sugar-crusted top and edges give a little sweet crunch. I’ve taken them to holiday parties and they always get high marks. 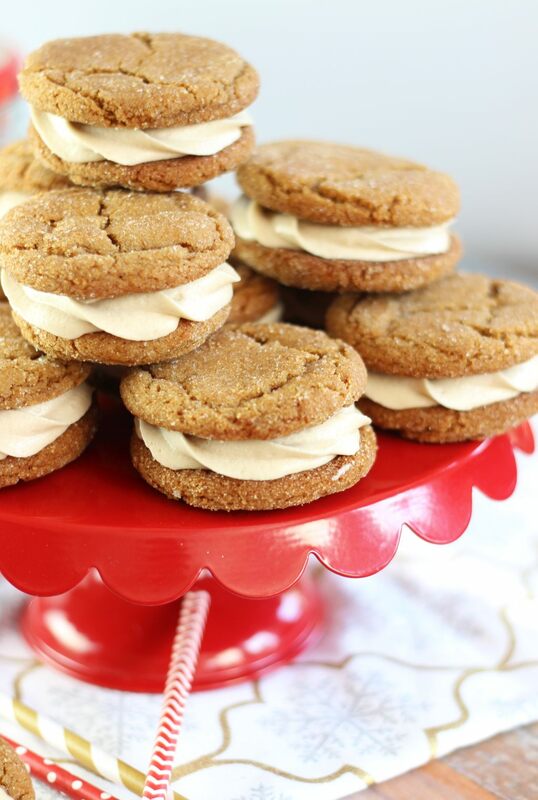 My initial idea was to make sandwich cookies with an eggnog buttercream, because, hello, that would be delicious. I learned what a special combination eggnog and gingersnaps are when I made this No Bake Eggnog Cheesecake with Gingersnap Crust. They’re delightful together. However, I failed 3x at making eggnog buttercream and got tired of wasting eggnog and powdered sugar for one day. 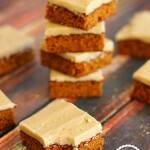 I turned to my next favorite flavor to match with ginger and molasses: caramel. 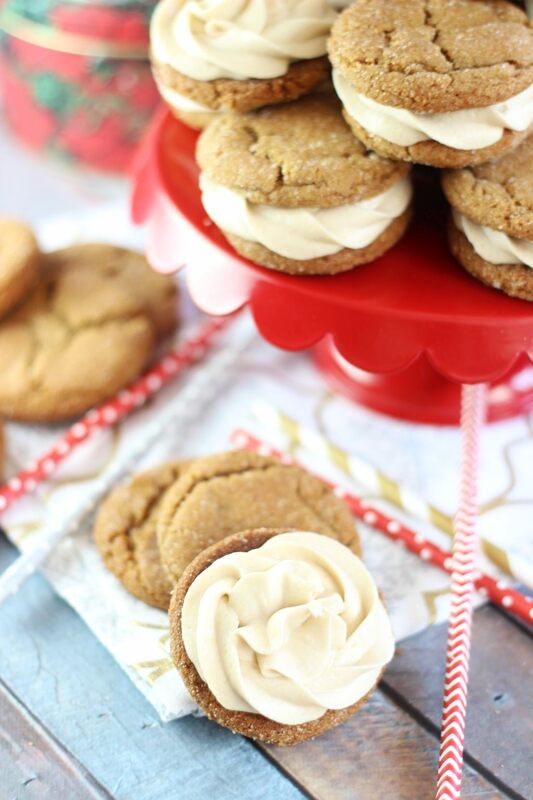 I’m such a sucker for this combo – I just love caramel and gingerbread together. 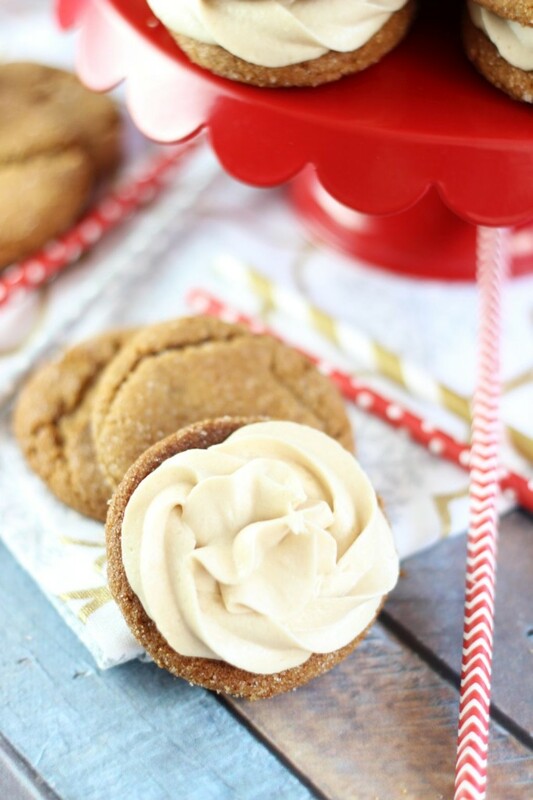 The buttercream includes caramel sauce and caramel extract, so it’s not short on caramel flavor, and a thick layer between two ginger cookies is amazing! 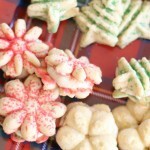 This quickly became one of my favorite Christmas recipes this year! 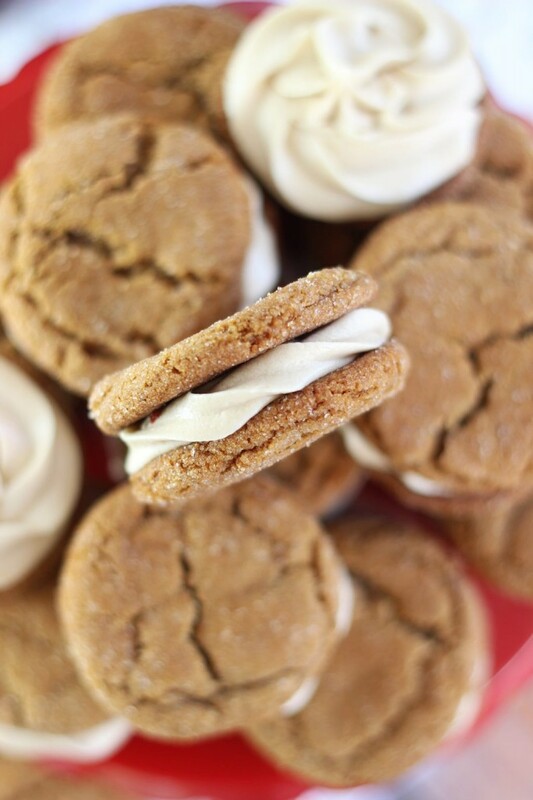 Soft and chewy molasses ginger cookies are sandwiched together with caramel buttercream frosting! Add in egg and molasses. Mix until well-combined. In a medium bowl, combine flour, baking soda, and spices until well-blended. Add flour mixture to mixing bowl, beating until well-combined. 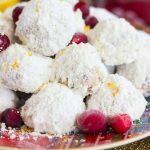 Roll dough into 1-inch balls and roll the balls in granulated sugar. Place them 2 inches apart onto ungreased baking sheets. Bake at 350 degrees for 8-10 minutes. Cool on wire racks. In a large mixing bowl, beat butter and caramel sauce til blended. Add enough powdered sugar that the frosting is thick and fluffy, but spreadable. Beat until fluffy. You must measure the molasses accurately. Too much, and the cookies will get sticky and goopy. I find caramel extract easily at Walmart! These look so good!! Pinning. The cookies look gorgeous Sarah, it’s okay if you didn’t get the eggnog buttercream right because the caramel sounds equally fantastic! YUM! Thank you so much! Though I’m determined that I will make eggnog buttercream work! Lol! Those look incredible. 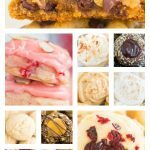 So, which family cookie IS your favorite? Mernie-O’s? I have to think about that. Maybe snowballs? Or lemon bars? I mean, I really like the ginger cookies, they’re just not my favorite. 🙂 Mernios are great too though! Ginger cookies are a fave of mine and that buttercream in the middle looks to DIE for 🙂 Pinning! So glad you like them, Medha! Thanks so much! I’m not the biggest fan of eggnog but I am a HUGE fan of caramel so I love this combination! That worked out well then. Lol! I do like eggnog and I still want to make that work, but the cards were just against me that day! Caramel butter cream?? That sounds heavenly!! These sandwich cookies look amazing!!!! It IS heavenly! I am so in love! I’d never tried it before, but it turned out perfectly, and the caramel flavor is nice and strong!! These cookies are gorgeous Sarah! Will definitely try them! Lol! Your comments are always hysterical!!! Thanks so much, girl. So glad you like them! i so want one of these now! they look so good! Thank you so much. We LOVE them! Oh my goodness, these look absolutely delicious… definitely pinning! Your cookies look so yummy. Pinned & shared. Happy holiday season. Hope to see you again soon. 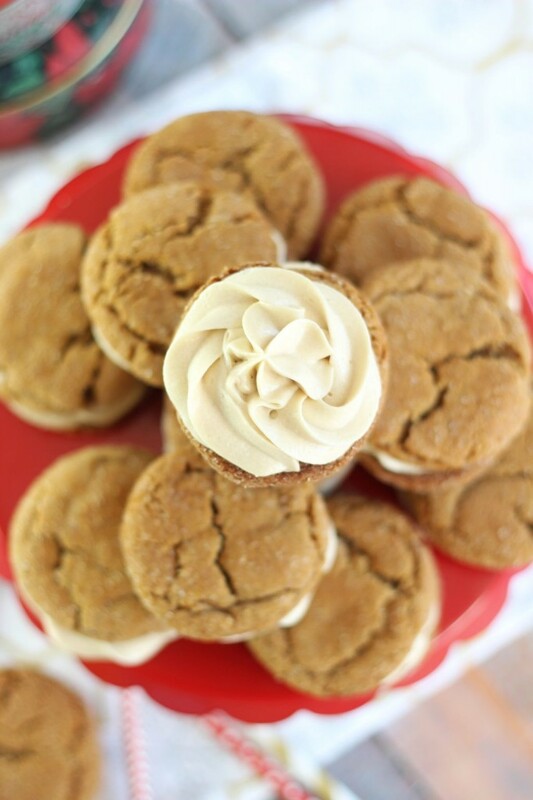 Love the addition of the caramel buttercream! Punching up the delicious ginger crunch!